Tiffani Faison brings pulled pork, brisket and ribs to Boston's Fenway neighborhood. : Tiffani Faison became a household name after becoming the runner-up on Bravo’s “Top Chef” in 2006. We then followed her to Rocca where she reinvented the menu. Sweet Cheeks is her own barbecue joint located near Fenway Park. 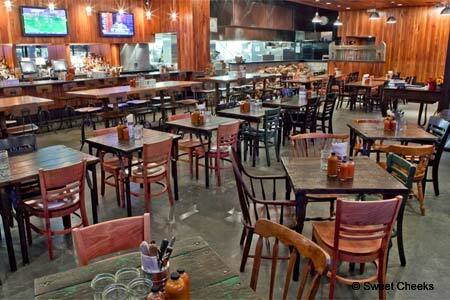 Grab a seat at one of the communal high-top tables crafted from church doors and bowling alley lanes. Ribs with meat that falls off the bone, tender brisket and short ribs are turned out via a 4,700-pound smoker, which Faison affectionately named “Tootsie” after famed Southern pitmaster Tootsie Tomanetz of Snow’s BBQ in Texas. So roll up your sleeves and grab a tray of Berkshire pulled pork and pair it with a “cold scoop” of coleslaw, potato salad or carrot and raisin salad and a “hot scoop” of black-eyed peas, mac ‘n’ cheese, collard greens or broccoli cheese casserole. We can’t get enough of the pork belly sandwich served on hot griddled Texas toast. For dessert? What else but sweet potato pie. Be sure to check out the outdoor beer garden in the warmer months, which comes complete with a porch swing.